Product #6177 | SKU HSC171 | 0.0 (no ratings yet) Thanks for your rating! The new HSC 171. Studio quality at its best. 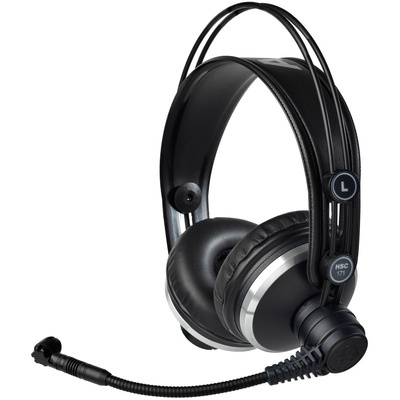 AKG's professional headset HSC 171 has been designed for broadcast and recording use. Derived from the proven K 171 MkII Studio headphones, the HSC 171 is available with a condenser microphone. In addition to excellent comfort, optimum ambient-noise attenuation, and outstanding audio quality, the HSC 171 uses the same proven detachable cable as the Studio Series headphones. So should a cable become defective under the enormous stress of day-to-day broadcast work, it can be replaced quickly and without any tools. The flexible microphone arm swivels through a 270-degree arc and mutes the microphone automatically as you move it up - no need to fumble for a mute button! Also, you can wear the microphone to the left or right of your mouth depending on your preferences or available space. According to AKG's successful studio headphones K 171 MkII the new HSC 171 also gives a modern look-and-feel. The proven closed-back design ensures a high ambient-noise attenuation for loud enviroment but also avoids signal bleeding of the headphones. Swiveling through 270 degrees, the microphone arm allows you to place the microphone on the left or right of your mouth. Noiseless microswitches automatically activate the microphone when the swivel is in an "ON" position. In any other position the microphone is muted automatically. This allows the user control the microphone signal easily and intuitively. The elastic suspension attenuates mechanical noise appreciably and prevents the capsule from damage. Please note that all headsets are supplied without connecting cable. Have a look at the product cut sheet for choosing the right cable for your application.